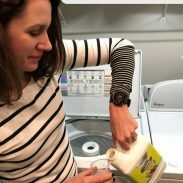 A couple years ago, I ditched the music on my runs for personal safety. The earbud headphones that I used reduced my awareness of my surroundings. Ever since then, I have run in silence for every run and didn’t miss my music. 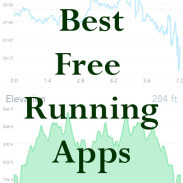 I found that I could better pace myself on speed workouts and better control my effort on easy runs. However, I found myself wishing I could listen to audiobooks on my easy-paced long runs. Long runs provided the time to immerse my mind in a good story and the audiobooks helped pass time on an easy-paced solo long run, where no conversation and no focus on a certain pace and workout could help pass the time. I reluctantly used my iPhone headphones, with one earbud in my right ear and the left earbud dangling loose, bobbing against my shoulder as I ran. I had all but given up on wireless headphones after we tried multiple brands and continued to be disappointed. I remember once trying a pair of in-ear wireless headphones and not even making it a mile before I removed them, frustrated by the discomfort. That was until I tried Aftershokz Trekz Titanium wireless headphones. 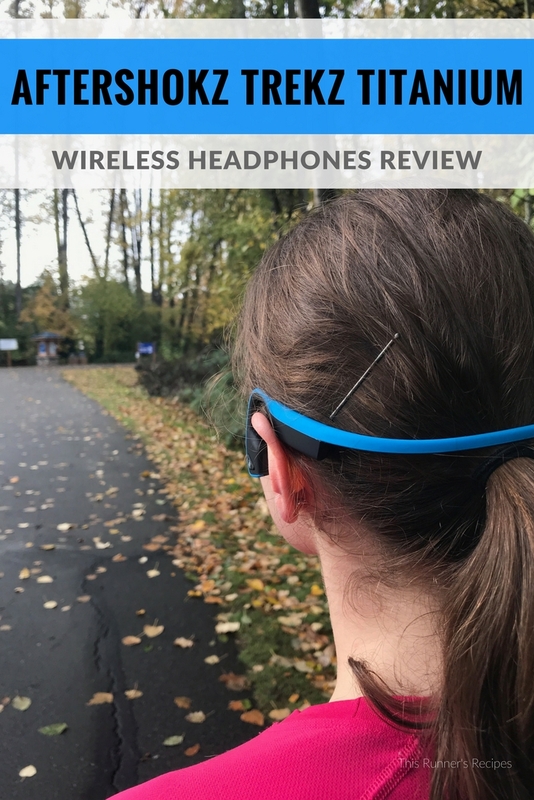 These headphones use bone conduction technology for an open ear design that prioritizes safety and comfort – and are now both Ryan’s and my go-to choice for long runs, treadmill runs, and more. Over the course of the past month, I tested the Trekz Titanium headphones on an easy run, a 16 mile hilly long run, a strength training workout, and multiple walks. My husband tested these on treadmill runs as well – and with each test run, we both appreciated the excellent design of these headphones. What makes these headphones worth the price tag? Aftershokz Trekz Titanium wireless headphones are different than any other headphones you have used before. Rather than sitting in your ear, the Trekz Titanium sits just outside of the ear and transmit audio through bone conduction. This style allows you to remain completely aware of your surroundings and protects your hearing. The headphones sat just outside my ears in an open ear style and used bone conduction to transmit the noise. 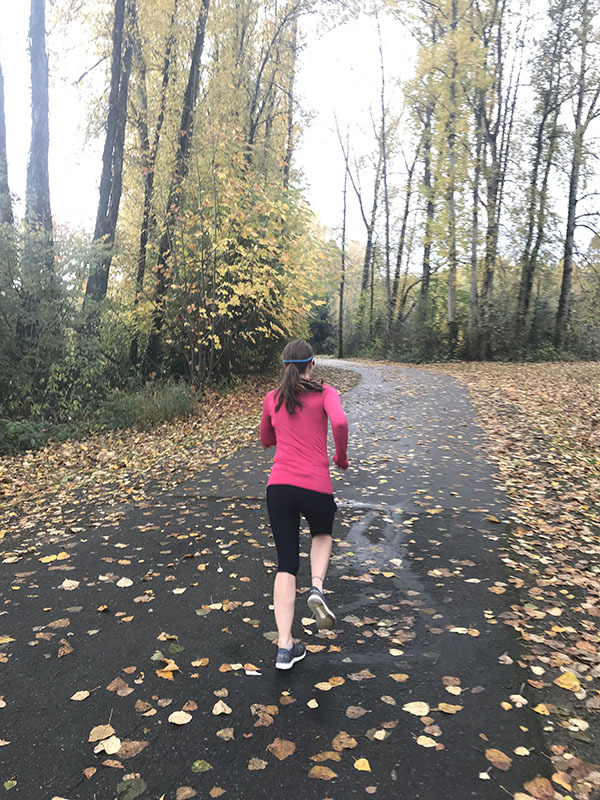 On my test runs, I could clearly hear my audiobook – and I could hear bicyclists as they came up behind me (including those who, ahem, forgot to use bike bells), cars on the road parallel to the trails and sidewalk, and other pedestrians along my route. The headphones did not compromise my awareness of my surroundings. I felt safe enough to wear these headphones on a run through a nearby neighborhood. I was able to hear cars as they exited driveways and could even hear the school bus before it rounded the corner – far better awareness of my surroundings than I would have with traditional in-ear headphones. However, these headphones are not mini-speakers. Through the bone conduction technology, you have a private listening experience – other runners around you cannot hear your music or podcast. Currently, I’m listening to the Harry Potter series on Audible – and with the AfterShokz headphones, I haven’t missed a word. The audio quality is clear and crisp, with a wide dynamic range. For music, the headphones produce a rich bass with an EQ preset. In addition to high-quality audio, these headphones offer excellent quality on calls. The dual noise-canceling microphone minimizes background noise on calls. Unlike other wireless headphones I had tried, I didn’t get so annoyed with these that I ripped them off after a couple miles. Quite to the contrary, the open ear style is snug yet remarkably comfortable, even when running long or running on hills. Without anything pressing against my ear canal, I was able to comfortably use these headphones for a 16 mile long run. The design fits easily around a hat, headband, or ponytail. What stood out to me the most was how comfortable these headphones were while running in the wind. 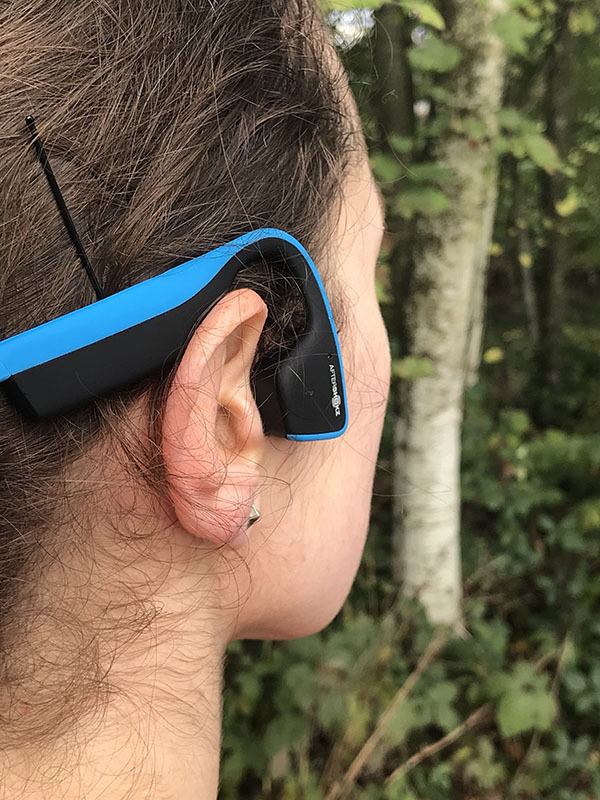 Normal earbuds create an unpleasant sensation and produce a whooshing sound when running into a headwind, but the out of ear design of the Trekz Titanium remained comfortable even in a strong headwind. The Trekz Titanium headphones have wireless Bluetooth 4.1 connectivity to connect seamlessly to your phone. In all of my trial runs, the connection remained strong (my phone was in the back pocket of my shorts). During test calls, I was able to roam around my living room and maintain a connection between the headphones and the phone. A conspicuous button on the left headphone makes pausing and unpausing simple and quick. I cross over a busy intersection on one of my long run routes, and I was able to easily tap the button to pause the headphones while crossing the intersection and then seamlessly resume play once I was back on the path. The volume buttons can be easily adjusted while running as well, although not as smoothly as the pause button, so I prefer to set the volume before starting a run. Aftershokz headphones can go the distance with you on a run. A single charge provides enough power for 6 hours of continuous audio and calls – enough to keep you going through a marathon! The headphones plug directly into the outlet for easy charging. One thing that Ryan noted is that the headphones are uncomfortable when wearing glasses. But other than that issue, there are no complaints we have about the style or function. AfterShokz offers a two-year warranty on their headphones and a 45-day money back guarantee when you purchase from their website. The Trekz Titanium cost $129 and come in a variety of colors including slate, ocean, ivy, red, and pink and two sizes (regular and mini). 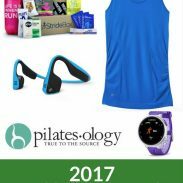 You can purchase them on the AfterShokz website or from outdoor gear retailers including REI and many local running stores. I received these headphones in exchange for an honest review. All opinions expressed are my own. Do you prefer audiobooks, music, podcasts, or nothing on a run? Would you try these headphones? Thank you so much for posting this! I am really considering asking for these for Christmas, because I would love a good pair of wireless headphones. I hate earbuds and I definitely want something that will allow me to hear cars and other noises while I run. Thanks for the note about the sunglasses. This concerns me a bit because I imagine I will mostly use headphones on weekend long runs, and when its sunny out I like to wear sunglasses. So that may be an issue. I really think you would like these! The glasses were not a big issue – Ryan still uses these headphones while wearing glasses, it’s just something I wanted to note for readings. I manipulate around how the headphones sit based on my hat and hair (as long as they are on the cheekbone, they work) so I think you could adjust them to fit comfortably with sunglasses. I’ve been considering wireless headphones. These are intriguing. Earbuds don’t stay in my ears, my current headphones are the kind that wrap around my ear – and I only wear one for safety reasons. The only thing that concerns me about the Trekz is fit. I have a small, narrow head. Are they adjustable? 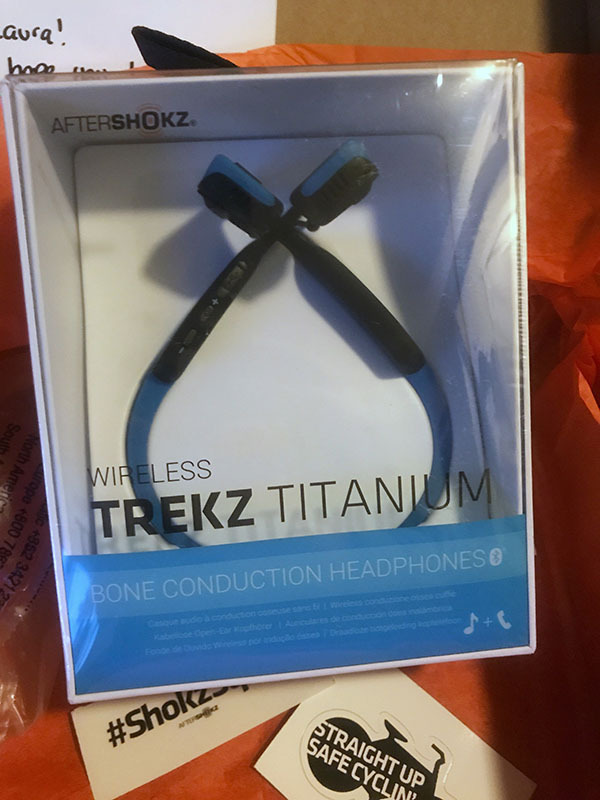 They have a mini size specifically designed for smaller heads – you can find a size guide on their website and order the mini size here: https://aftershokz.com/products/trekz-titanium. I highly recommend them – a perfect Christmas gift! Although a little more expensive, I have found the Apple Airpods to be the perfect running headphones. Because they are completely wireless, you can leave one in your ear and the other at home (or, my wife and I found a hack that allows her to use the left one while I use the right one to listen to different music). By only having an Airpod in one ear, I can hear everything around me while not having to worry about the other one bouncing around. It has made running with headphones MUCH more pleasant! I have seen people running with those and I am glad to hear they work! I personally do prefer the open ear style of the Aftershokz (the in-ear style was never completely comfortable) but everyone has different – and what matters is finding something that balances safety with a good listening experiencing. the 2 year warranty is key if you ask me since most of the headphones I’ve bought in the past always seem to break! as we discussed, I need to check these out. A warranty that long means they are built to last also! I really think you should check these out. For the price, it’s great that they have a 2 year warranty. For some reason, my headphones never last that long. The design is a very cool idea, I’ve seen nothing like that before. I love testing new technology. Glad to know these worked out for you.